Purpose: Due to the established role of the human papillomavirus (HPV), the optimal treatment for oropharyngeal carcinoma is currently under debate. We evaluated the most important determinants of treatment outcome to develop a multifactorial predictive model that could provide individualized predictions of treatment outcome in oropharyngeal carcinoma patients. Methods: We analyzed the association between clinico-pathological factors and overall and progression-free survival in 168 OPSCC patients treated with curative radiotherapy or concurrent chemo-radiation. A multivariate model was validated in an external dataset of 189 patients and compared to the TNM staging system. 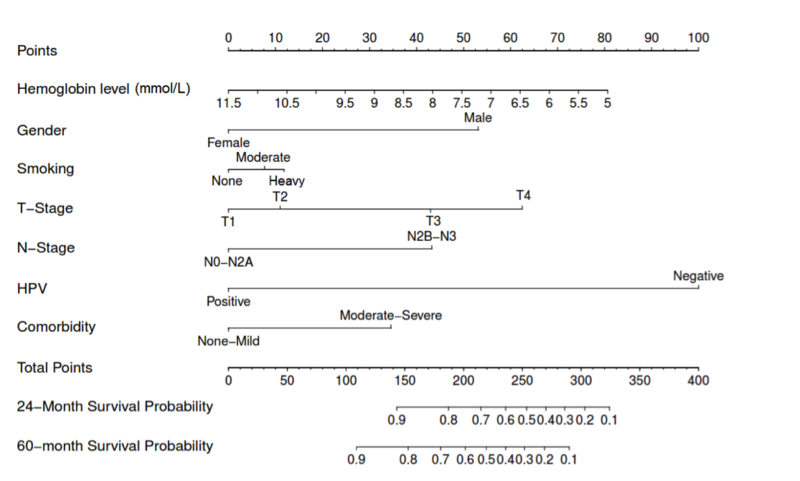 This nomogram is given below. Results: Predictors of unfavorable outcomes were negative HPV-status, moderate to severe comorbidity, T3-T4 classification, N2b – N3 stage, male gender, lower hemoglobin levels and smoking history of more than 30 pack years. Prediction of overall survival using the multi-parameter model yielded a C-index of 0.82 (95% CI, 0.76 – 0.88). Validation in an independent dataset yielded a C-index of 0.73 (95% CI, 0.66 – 0.79. For progression-free survival, the model’s C-index was 0.80 (95% CI, 0.76 – 0.88), with a validation C-index of 0.67, (95% CI, 0.59 – 0.74). Stratification of model estimated probabilities showed statistically different prognosis groups in both datasets (p < 0.001). Conclusion: This nomogram was superior to TNM classification or HPV status alone in an independent validation dataset for prediction of overall and progression-free survival in OPSCC patients, assigning patients to distinct prognosis groups. These individualized predictions could be used to stratify patients for treatment de-escalation trials. The figure shows the multivariate model converted to a graphic nomogram for prediction of overall survival. Each variable in the model, corresponding to the characteristics of an individual patient, is assigned to an individual score. A probability for overall survival can be calculated by drawing a vertical line from each predictor value to the score scale at the top—‘points’. After manually summing up the scores, the ‘total points’ correspond to the probability of overall survival (or progression free survival respectively, Supplementary Figure 1), which are estimated by drawing a vertical line from this value to the bottom scales to estimate overall survival. Smoking was categorized as none, moderate (1-30 pack years of smoking) and heavy (> 30 pack years of smoking).